On Friday we took a hike to San Agustín. San Agustín is one of the poorest aldeas (villages) surrounding La Unión and that is saying a lot. Most everyone in the village is either a corn or a bean farmer; there are no coffee farmers, which is the region’s only cash crop. Housing is humble, water is sparse, and electricity is non-existent. After an hour-long hike, we descended into San Agustín and I had my first view of an aldea. In a detached, tourist kind of way it is a really beautiful scene. Huts of mud, stone, and branches are nestled in a lush jungle with mountain peaks above and a river flowing below. We could have been walking through a Planet Earth DVD if only David Attenborough had been narrating. But even if I had wanted to, it would have been impossible to stay detached for long. The idea of the trip was to interview a couple of UMF clients. I use the term 'interview' loosely. We were not trying to extract information so much as we were hoping to get a sense of their lives by just asking some questions, hearing their stories and letting the conversation flow. One of the men we spoke to was Domingo Paz. Domingo was a quiet character, but when he spoke his voice carried a weight and a passion so that everyone in the room felt every word. The first thing Domingo told us was how grateful he was for what UMF is doing. It could not have felt more sincere. It is a hard thing to explain, the power of an earnest speech, but one could tell he meant everything he said and his eyes punctuated each point. There was no doubt in anyone's mind that the loan he had gotten had helped him feed his family. For me, the most powerful thing Domingo told us was his dream for the future. When we asked the question, his first response was to own some good land so he could grow coffee. 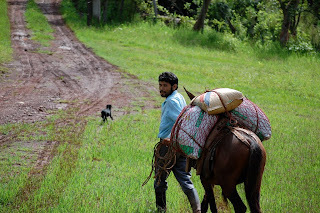 The land around San Agustín is too low in elevation to produce coffee well, accounting for much of the aldea's poverty, even relative to other villages in the region, so this was likely a dream shared by many in town. But then we pushed him to think bigger. In an ideal world, if anything were possible, what would he wish for? After some deep thought, his answer was water. This might not come as a surprise to most people because water is the greatest need in much of the developing world, but the way Domingo said it struck a chord with me. When he explained what bringing water to the community would mean to him, his family, and everyone in San Agustín, Domingo--a solid farmer with a thick beard and strong face-- was on the brink of tears. In his wildest dreams, in his ideal world, what Domingo wanted was water. Both a simple request and a grand wish at once. Sitting across from Domingo, watching him hold back tears, it was impossible not to look at myself and think about everything I take for granted. At no point in this trip have I been more grateful to be here, paying my debt to society and making a difference in the lives of people who truly deserve it.